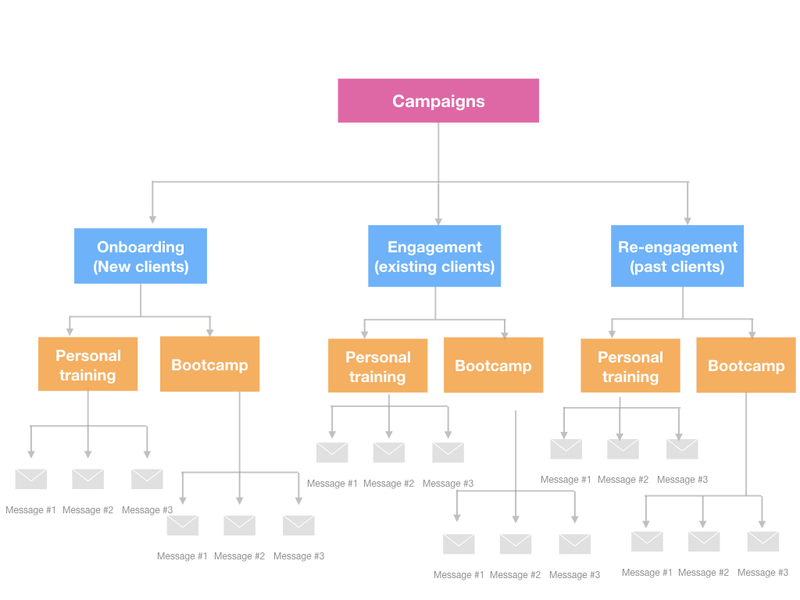 What is an automated messaging campaign? Automated messaging campaigns are a sequence of personalised messages that can be programmed to be automatically sent to your clients, if they perform any activity that matches the set trigger condition. 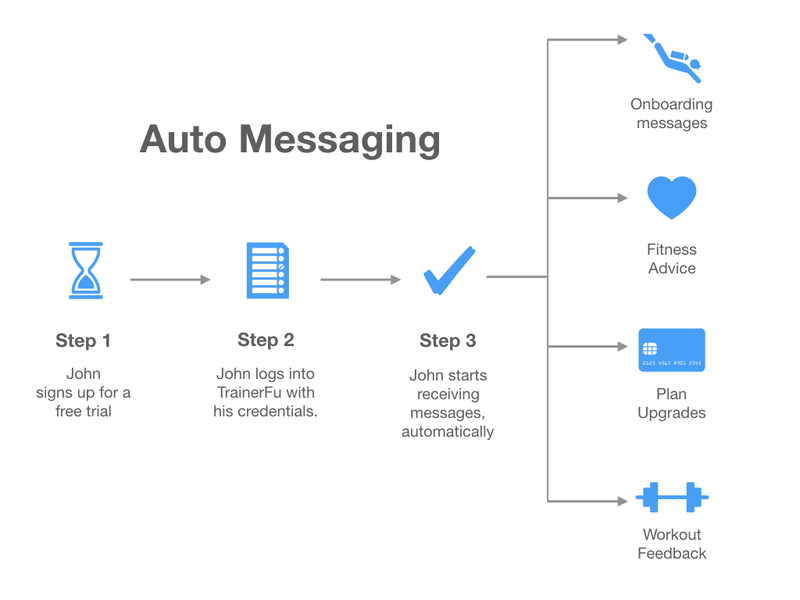 As you can see in the diagram above, John starts receiving all the messages automatically, based on the programmed auto-messaging sequence. 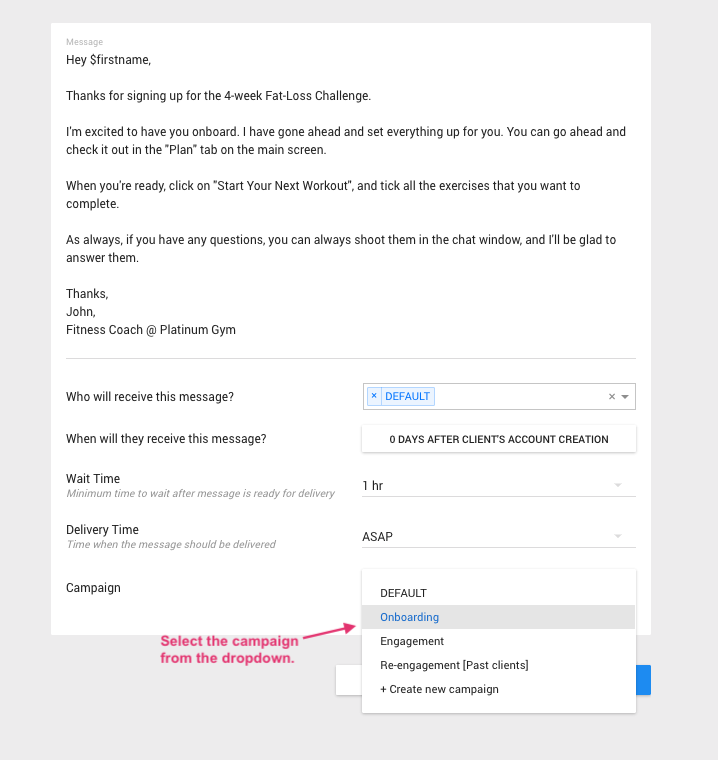 We've already explained in detail how you can configure an automated messaging campaign, but in this article, we're going to explain how you can craft your messages and compile them into messaging campaigns. 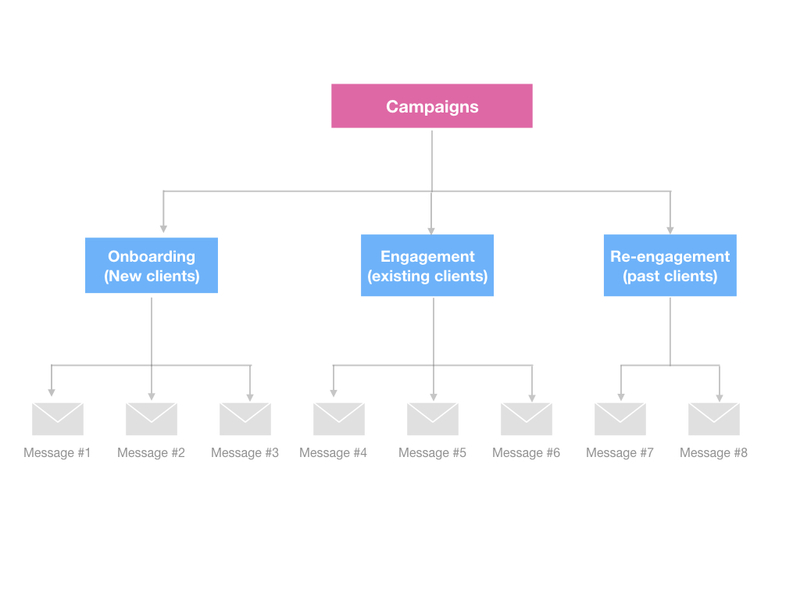 How to structure an auto-messaging campaign? While there are multiple ways you can structure an auto-messaging campaign (and there's no right/wrong way to do it), we'll discuss the most logical way to structure your automated messaging campaigns -- based on their training plan and position in the sales process. You need to create different messaging campaigns to nurture clients at each of these stages, because every stage requires a different level of client engagement. For example, you might want to reach out to past clients and offer them a free consultation, but your existing clients might not be that interested in a free consultation, and would rather be seeking personalised feedback or advice on their progress reports/assessments. Onboarding (new clients): The messaging campaign that helps in delivering an initial hand-holding experience to clients. This includes welcoming them to the gym, giving them knowledge on their training plan, sharing workout tips, and so on. The goal of onboarding campaigns should be to showcase value to new clients, and turn them into long-term clients. Engagement (existing clients): The campaign will focus on building engagement with your current clients by ensuring they are striving to achieve their fitness goals. This would include following up with them every few days on how they are doing along with personalised workout feedback and fitness advice. The goal of engagement campaigns should be to ensure that your existing clients feel great about the personal training experience, and to ensure that they train with you on an ongoing basis. Re-engagement (past clients): With this campaign, the focus will be on re-engaging clients that have already trained with you in the past, but have not renewed their subscription. It can also include leads that have a higher chance of conversion, provided they are nurtured well. The goal of re-engagement campaigns should be to re-engage your past clients, and convert them into long-term clients. The advantage of defining messaging campaigns at a much more granular level is simple -- it allows you to create more personalised messaging experiences, based on the plan that your clients have chosen. Once you have configured that level of personalisation, you can share more relevant fitness advice, workout tips, upgrade links, etc., thereby improving your chances of converting those clients into long-term customers. How to configure an automated messaging campaign? NOTE: Please note that the above suggested campaign structure is just a blueprint that you can use to quickly create auto-messaging campaigns. It's NOT mandatory to create campaigns in the above format, and you can always get creative with it. We'd love to know how you're using auto-messaging campaigns. You can share your feedback/suggestions with us on: support@trainerfu.com.